On Sunday, Borussia Dortmund deservedly took the lead against Bayer Leverkusen through the combination of a quick counter-attack and a disastrous goalkeeping error. 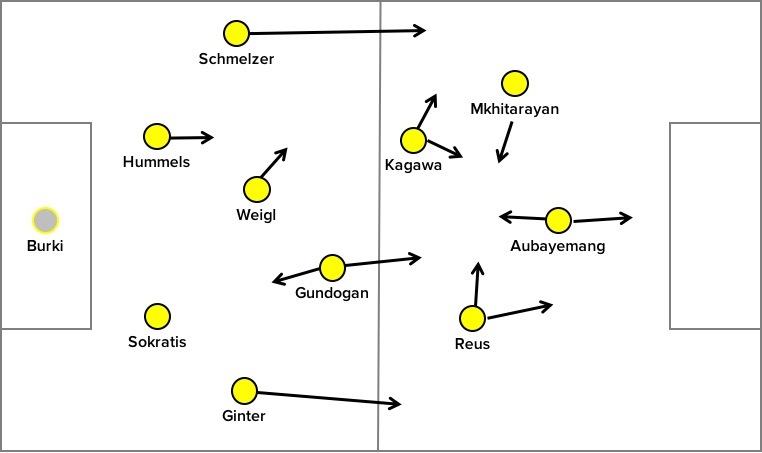 However, this was actually atypical of how the game had unfolded, with Dortmund’s dominance predominantly derived from their excellent possession play when building up attacks from the back. This has been a hallmark of their season so far under new manager Thomas Tuchel. As Tom Payne explained in his lengthy analysis of Dortmund’s season so far, they have shifted away from Klopp’s preference for ‘heavy metal’ counterpressing towards a style of play based upon Juego du Posicion, a tactical approach that emphasises effective use of possession via a strict positional framework of integrated movement. If that sounds complicated, that is because it is. Juego du Posicion relies upon players understanding their specific roles in all aspects of the game, as the system demands certain spacing and distances between players in order for attacks to be constructed effectively. A good coach is able to simply the roles of players in a Juego du Position system into clear and effective tasks. Tuchel’s new-look Dortmund team is an excellent case study of this. Here, I’m going to focus specifically on the role of Julian Weigl, the holding midfielder (the #6). Weigl has been an inspired new signing for Dortmund, arriving from second division side 1860 Munich and promptly starting every league match this season. Despite being only 20, Weigl has shown great maturity in what is a high-pressure position that demands great intelligence and understanding of the game. 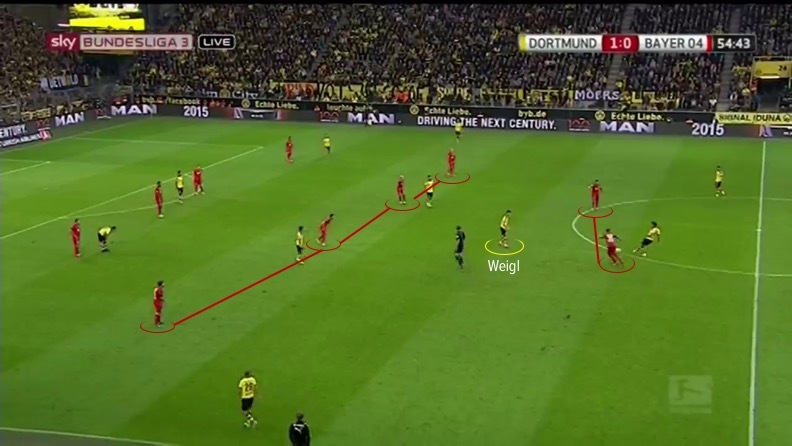 In Dortmund’s Juego du Posicion, Weigl plays an important role in building up from the back. He is responsible for ensuring the ball is progressed upfield in a controlled manner, doing this by constantly looking to receive possession in space and then distribute effective forward balls into the attacking players. Below is a typical scene in Dortmund’s build-up phase. The two centre-backs split to the approximate width of the penalty box, the full-backs get high and wide and goalkeeper Roman Burki nearly always looks to distribute short to a player in the back four. Straightaway, we can see elements of Tuchel’s Juego du Posicion, with the specific spacing of each player in the back four during the build up phase an example of players occupying certain zones in order to create effective possession. In the back third of the pitch, Dortmund are utilising the maximum width and depth of the pitch, making it difficult for the opposition attackers to defend all passing options efficiently. To turn possession into penetration, Tuchel’s system requires players to be positioned between the opposition’s defensive lines, so that the players on the ball (in this example, the centre-backs) can pass the ball forward in both a controlled and penetrating manner. 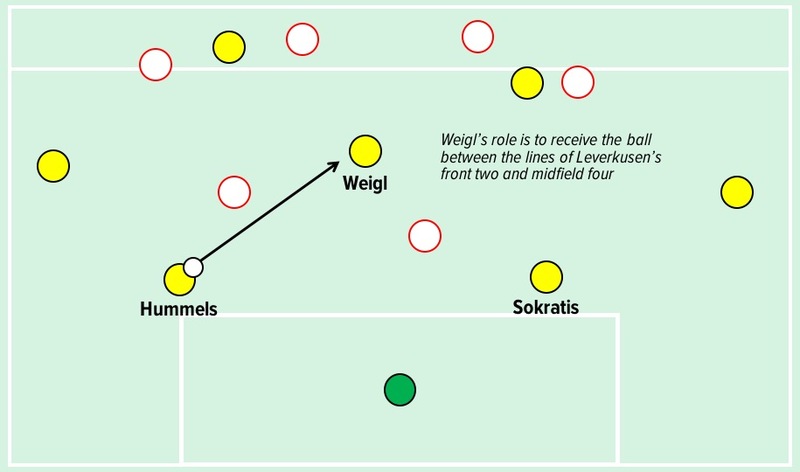 Weigl’s role, therefore, is to position himself between the oppositions first and second defensive lines, in order to receive penetrating passes from the back four. We can see the real-life application of this instruction in the screenshot below from Dortmund’s match against Bayer Leverkusen below. Here, I have highlighted Bayer Leverkusen’s first and second defensive lines – the first line being their front two (Stefan Kiessling and Javier Hernandez) and the second line being the midfield four (with the wide players dropping back alongside the central midfielders). We can clearly see Weigl positioned between these two lines, able to receive a clean pass from Hummels (who is on the ball) and face forward. This is the first step in the creation of an effective attacking opportunity. Weigl is able to receive the ball in time and space and look to progress the attack further forward, having removed Leverkusen’s front two from the play. This video of the scene discussed above illustrates how Weigl’s position allows Dortmund to progress the ball forward cleanly. …and sometimes even the goalkeeper, Burki, can find Weigl between the lines. 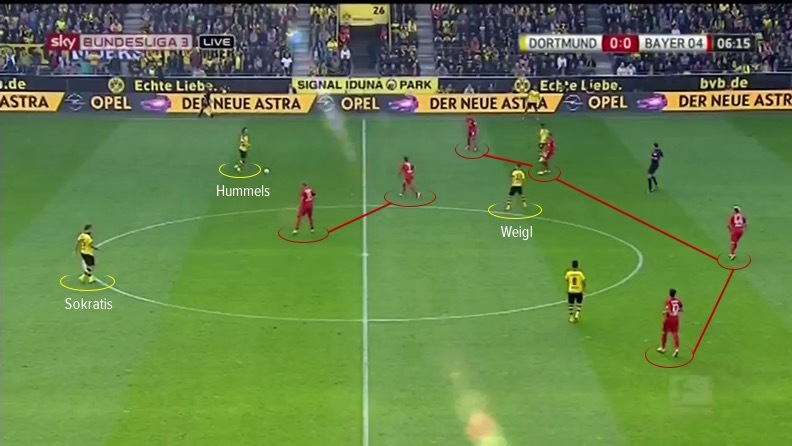 It’s worth remembering that while this is only one component of Borussia Dortmund’s Juego du Posicion system, Weigl’s intelligent movement and positioning in the #6 role is the platform for the overall attacking structure. Through constantly being able to receive the ball in positions between the lines, he is in time and space to distribute the ball to attackers positioned higher up. 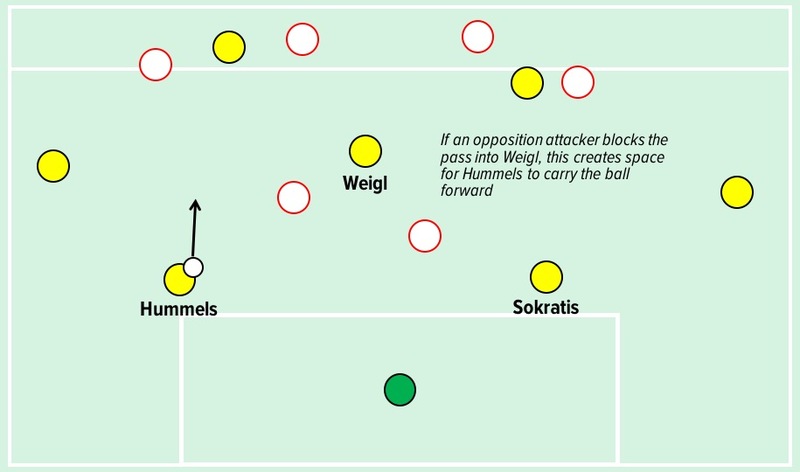 Furthermore, in moments where passes into Weigl are blocked off by opposition attackers (something Hernandez attempted to do sporadically in this match), this creates space for others to progress the ball forwards themselves. For example, if Hernandez focuses on blocking passes into Weigl, that creates space for Hummels to carry the ball forward. The centre-back is excellent at playing penetrating passes, something best demonstrated by his superb ball for Dortmund’s first goal of the season, against Borussia Monchengladbach. It may be early days in the Bundesliga, but Julian Weigl has clearly established himself as a key cog in Borussia Dortmund’s new-look possession-focused style of play. While still young (sometimes made obvious when he attempts ambitious long balls) he has shown great understanding of the #6 position, particularly in the build-up phase, enabling Dortmund to attack with proactive, effective possession. In many ways, he is reminiscent of Sergio Busquets – another player whose great strengths lie in his movement and positioning to create space both to receive passes himself and create space for others.